Tuesday January 25th 2000 - Earls Court, London. A dull, crisp morning in West London and the opening of the UK's premier trade show for the amusement industry, or something like that. It's ATEI (Amusement Trades Exhibition International?) and that means all the games you can eat. ATEI itself covers video games, jukeboxes, slot(fruit) machines, simulators, fairground rides, locks, keys, cabinets, trolleys etc. I expect you've got the idea by now. If you run an arcade or seaside attraction then you'll love this show. Fortunately, it's also a bit of a shrine for the players to see what's new and try everything out free of charge and that's where I (and probably you too) come in. 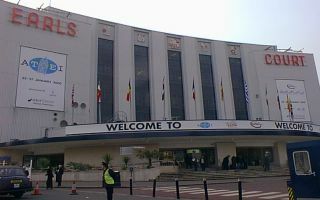 In the adjacent hall is the gambling equivalent of ATEI called ICE (International Casino Exhibition), so Earls Court is packed with people desperate to spend money suddenly finding that they don't have to - weird! The pinball showing at ATEI can be summed up in one word - disappointing. If you're thinking of going just for the pinball content, then don't. Compared to previous years there's a real lack of games. 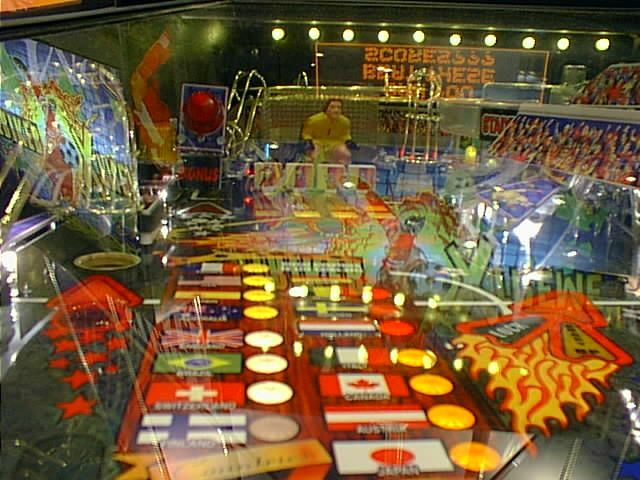 The show guide lists 15 companies with pinball products on their stands, but we found the few games on stands not listed. 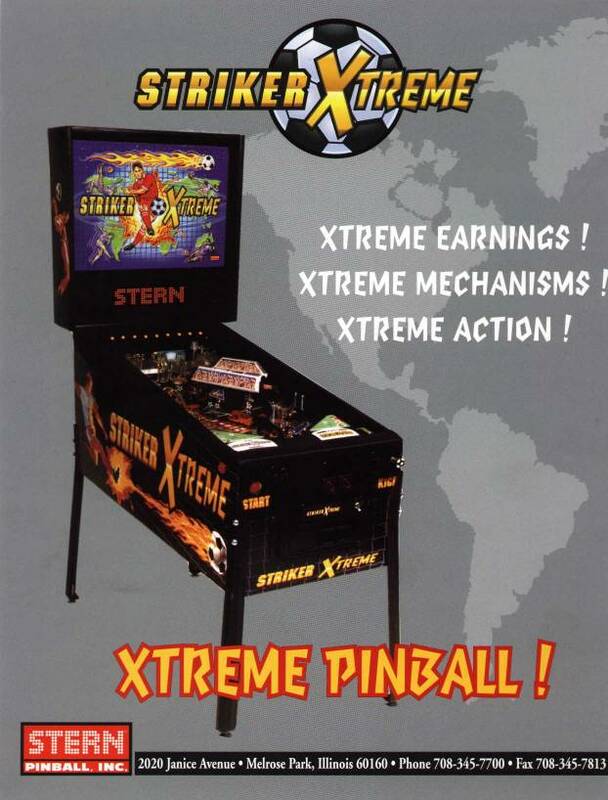 The one reason for going though, is Stern Pinball Inc's new game - heck, the new pinball game - Striker Xtreme. This is the Electrocoin stand, and as they are Stern's distributors in the UK, they had seven of the new games of show, and they had Gary Stern wandering around talking to the punters. 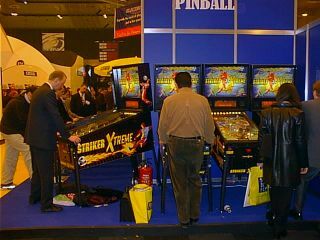 European distributors Nova had another 4 Striker Xtreme's on their stand together with a Star Wars - Episode 1 in German. Now, before I continue, it's important to note that these games were not production games. There were both software and hardware problems that need to be sorted out, and I've detailed those that we found a little later on. That said, I doubt that much of what you see in these pictures will change, so on with Striker Xtreme (or SX as I'll call it from here on). The main feature being pushed by the sales staff at Electrocoin, was SX's simplicity. A back-to-basics approach with a wide, open, uncluttered playfield. The backglass above follows this idea, having a strange late 70's / early 80's feel to it. SX was designed for the European market in particular, so many European countries feature as teams in the gameplay. The main toy is the Goalkeeper, located top centre-left. He's crouched down, but mounted on a large plastic err......(don't say "toilet", don't say "toilet")..... toilet. D'oh! No really it does look like he's taking a dump. Go on, admit it. It does look like a toilet doesn't it? Apart from that fantastic description, the Goalie swings left and right all through the game (Hmm, wonder how long that's going to last). His task is the usual one of keeping the ball out of the goal behind, either by simple blocking or catching the ball between his legs. There's a magnet mounted on the WC below to catch the ball, but slam the ball into that gap between his legs, well I swear I saw tears in the goalie's eyes. 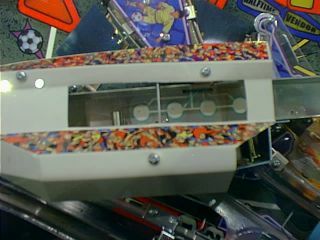 In front are 4 drop targets which require increasing number of hits to knock them down, indicated by the lights in front of them on the playfield. Annoying bug: The ball can get stuck behind the leftmost drop target. And it does - frequently. There's an LED sensor across the goal just behind the drops which senses this, and lowers just the left drop to free the ball, but it takes 10 seconds to activate, and anyway it's a workaround for a design flaw. To the right of the goal is a sink hole with Vertical Up-Kicker. Mostly this hole does nothing, but for multiball it's a jackpot shot, and is the route for the ball out of the goal and back into play. So this VUK is going to get used a lot. On these new games it was struggling. Two, three, four tries to eject the ball were common. Looking down into the VUK, you get an idea why. That's a *very* deep VUK. It must sit about 3 inches (7.5cm) below the playfield. 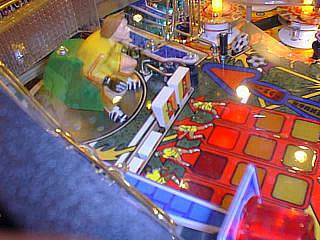 You can see in the picture above that the ball has to mate up with a circular wireform above the playfield. It's gonna fail guys, and when that fails, the whole game fails. Interestingly, though, the traditional IR LEDs used as sensors seem to have been replaced by visible red ones. I don't know what the receiver is, but it works and will be a great boon to spotting the broken transmitters - if it ain't shining it's broke. Another interesting development is found in the ball-lock mechanism on the far right centre of the playfield. The usual microswitches, or IR LEDs have been replaced by these pressure pads of the type found in membrane keypads like calculators or ATMs. I'm surprised that the weight of a ball is enough to trigger them but the seem to work just fine. While they look rather flimsy, and may not last as long as traditional components, they look easy to replace - they connect via a film ribbon cable - and should be cheap too. So what else about the game? It's fun to play, and fairly challenging. There are 16 teams to beat, but beating a team merely involves scoring a goal even though that may mean knocking down the drop targets 3 times. 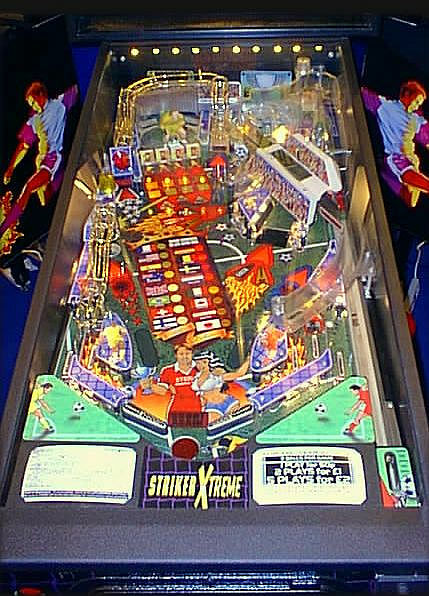 Regular Multiball is well implemented, usually a 4 ball variety with loads of shots lit for jackpots, and the tricky side ramp - made from the upper left flipper - scores Super Jackpot. On this software, the SJ always scored 6M points, even though the display indicated it was worth much more. There are many ball hang-up points. We found balls trapped behind the goal, behind the big red flasher at the top left of the picture above, and even balls trapped on the wireform out of the VUK. We also found software glitches with 2 balls in play (not by freeing the above hang-ups), when draining one, and hitting a switch with the other, instantly switched to the next player and autolaunched another ball. Finally before I forget, one bugbear from me. The high-score table takes 10 characters per name. Good (but liable to abuse, obviously), but please Mr Stern, can you add an "END" character to the letters available so you can quit when you've finished without having to pad out the name to 10 characters with spaces. If you don't want to add your name you have to enter 10 spaces or wait 95 seconds for it to time out. Oh dear, now this report sounds all negative and doom-laden. Please don't read it that way. We had a great time playing SX, aching wrists and all. There are many very nice touches to this game, and the time just flew by playing it. I know that there are changes to be made to the game before it hits the streets, so these comments are more suggestions than moans, and don't feel downcast by the faults I've picked up. With any luck you won't find (m)any of them. Here's the flyer from the show. It was even a prototype flyer as the production ones were double sided.